Despite contrary belief quite common among the recently deceased’s loved ones left behind in severe grief, ‘death notice’ and ‘obituary’ are definitely not the same thing. Each term denotes a very different type of publication designed to serve its own unique purposes. Indeed, failure to comprehend this can lead to serious financial or legal consequences. ‘Notice’ is the key operative word to keep firmly in mind during a very difficult time. As its root meaning implies, death notices are designed to provide notice that a person has died. Thus, a death notice should briefly summarize basic essential details. How to write a death notice? Unlike obituaries, death notices are typically prepared by relatives or friends and consist of bare minimum essential details. Common examples are the deceased person’s full legal name, date of death, surviving family members’ names, funeral or memorial service details, last place of residence, most recent employment, birthplace and date of birth. Depending on the circumstances, it might be wise to delete the deceased person’s exact street address and birth date to thwart predatory identity thieves. Another good idea is asking someone else to proofread a proposed rough draft of the death notice, as its author may be too distraught to be objective. Finally, distant kin who wrote a death notice should verify all details therein for accuracy and appropriateness with close family or friends of the deceased person. By direct contrast to death notices, obituaries are detailed biographies that family members pay newspapers to publicize to memorialize their dear lost loved one in a form for the whole world to read and remember. Most obituaries are prepared by professional journalists of the publishing newspaper. As already mentioned, obituaries contain more detailed personalized biographical information about the deceased person. Common examples include details about a decedent’s upbringing during youth, educational accomplishments during life, personality traits, vocational and recreational activities, civic and public service involvement, and individual views toward vitally important social issues or events. In addition, most obituaries include at least one picture of the deceased person. Most obituaries and death notices are published in local newspapers where the deceased last resided before they died. Other common publishers are civic or religious organizations and professional or trade associations. If the decedent lived worked or went to school in several different cities or states during life, consider publishing through multiple newspapers in the corresponding areas. Prior to submitting a final death notice draft for publication, verify prospective newspaper(s) editorial requirements and fees. Many widely circulated newspapers don’t publish death notices submitted by the deceased person’s family or friends, but do accept submissions from funeral home directors. 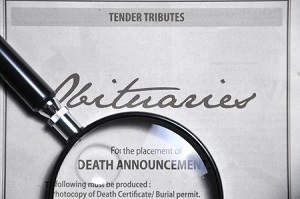 Many funeral parlors will prepare and publication of death notices or obituaries without charge, while some require a fee. In either case, it’s often easier to let the funeral home take care of all such details. This is especially true when death notices are obituaries will be published by multiple newspapers in disperse geo regions. The funeral director can handle all payment and billing, thereby leaving one less burden for family members to deal with during already difficult times. Also note that publishing fees are typically based on the total number of words contained in a death notice or obituary and whether it will include the deceased person’s photo. Finally, be aware that there are many online sources exclusively dedicated to publishing obituaries and related content. One such site is Legacy.com, which proclaims itself to be a “global network of online obituaries that provides timely news and allows users to pay respect and celebrate life.” Check it and similar virtual platforms out to find more details about high-volume exposure for desired obituary or death notice publications.